As most anthologies, this one started with an idea, or more precisely in this case, some "what if" thinking. The thought was amusing for a while, as we considered the reactions that would inevitably come from certain circles: the accusations, the outrage, the lectures as to how such things just "weren't done." All, of course, would ignore the fact that the exclusionary submission calls were very much done because, well, the fairness standards just aren't the same across the board. But then, after we've indulged in our daydreaming and considered some of the possibilities, we realized something. Trolling the hypocrites would've been fun. 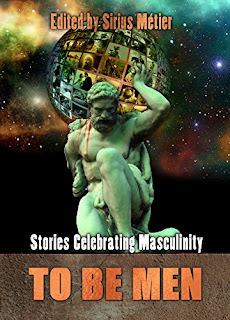 Stories about men as heroes and role models, fathers and mentors, hardened warriors and even fantastic creatures. Men who are interesting, capable and worthy. Characters whom you'd want to meet, to spend time with, to learn from, and whose stories will stay with you after the reading is over. And just like that, the authors' gender became irrelevant. Personally, although I tend to gravitate towards reading male authors, two of my favorite entries in this collection came from women (Monalisa Foster's Cooper and Julie Frost's Man-Made Hell). The paperback edition is ready to ship, just in time for Fathers' Day.